MassDOT will publicly kick-off the East-West Passenger Rail Study tomorrow with the first meeting of the East-West Passenger Rail Advisory Committee. Long awaited by many, this study will assess passenger rail service alternatives along the Boston–Worcester–Springfield–Pittsfield corridor. 60 Congress Street, Springfield, Ma. We will pass along links to the noteworthy media reports via the Trains In The Valley Facebook page with a longer report on the meeting which will appear in the next edition of the Rail News Roundup. It will be interested to see if other communities along the east–west rail corridor appoint similar committees to focus local attention to this important study. 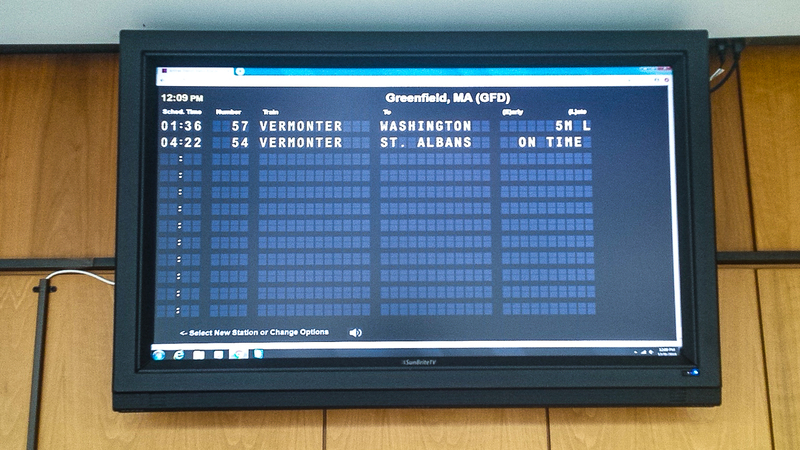 A train information display screen has been installed in the Olver Transit Center in Greenfield in the main waiting area. The layout of the information on the screen is meant to look like the slit-flap display screens that were once common at major Amtrak stations. The display information is provided by the firm Dixieland Software, at no cost. Clearly there is lots of room for more trains on this display screen. Last we checked the responsible parties at Springfield Union Station are still working to get the Amtrak train information added to the display screens in the main waiting room. We remain hopefully that this will happen before too long. Good news for people taking the train from Windsor Locks, CT — a new Ticket Vending Machine is up and running, as of November 16, 2018. 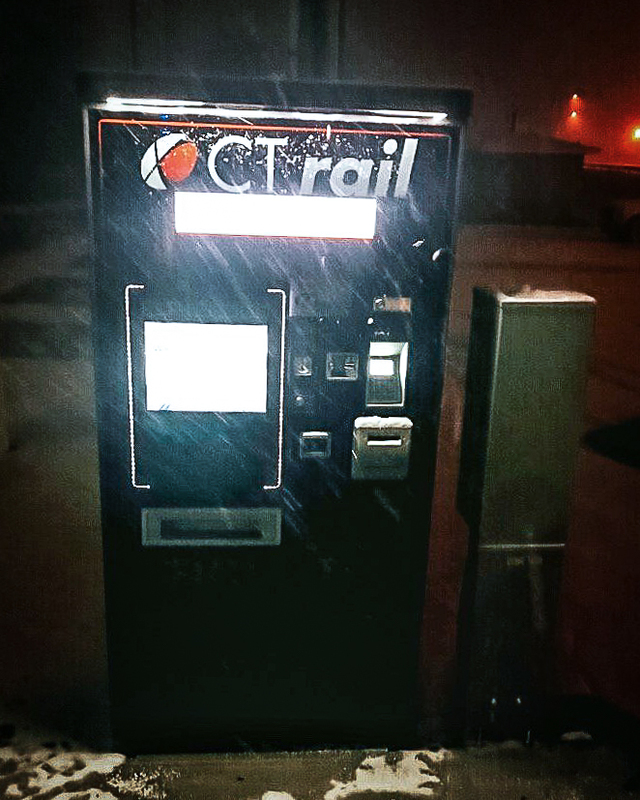 Tickets purchased from this machine are good for travel on any train (Amtrak or CTrail) between Springfield and New Haven — with the exception of the Vermonter. Note also that you can purchase tickets from this machine for travel on Metro-North trains, if your journey involved travel past New Haven. Senators Edward J. Markey and Elizabeth Warren, and Representatives Richard E. Neal and Jim McGovern have announced the release of a $10.8 million Better Utilizing Investments to Leverage Development (BUILD) grant to upgrade the 55-mile New England Central Railroad (NECR) main line through western Massachusetts. This $10.8 million BUILD grant will be combined with $9.6 million in already approved state funding from MassDOT’s Capital Investment Plan, and $9.6 million from the New England Central Railroad. The NECR line, which is owned by Genesee & Wyoming, runs from East Alburg, Vt. (on the Canadian border) to the port of New London, Ct. and passes through western Massachusetts along a rail corridor that runs north to south through Millers Falls, Amherst, Belchertown, Palmer and Monson. The planned upgrades to the line include the installation of 31 miles of new rail and 20,000 new crossties. Additionally, 20 bridges along the line will be rehabilitated and strengthened. Once this work is complete the western Massachusetts portion of the NECR line will be certified for the movement of 286,000 lb. gross-vehicle-weight (GVW) rail cars. At present the line can only handle non-standard 263,000 lb rail cars. This limitation prevents the movement of many rail shipments along this rail line today. Our understanding is that the NECR line in Vermont and Connecticut has already, or soon will be, be rated to handle 286,000 lb. GVW rail cars. 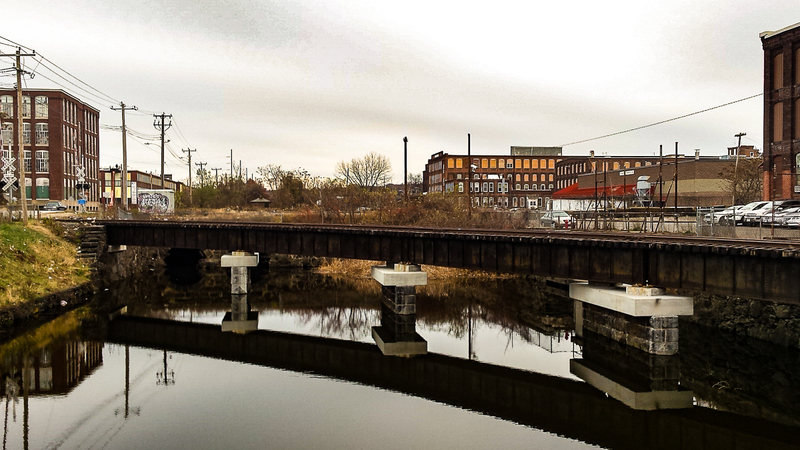 The Pioneer Valley Railroad (PVRR) and its contractors have completed the rehabilitated of the curved open deck bridge in Holyoke that carries the PVRR over the Third Level Canal near Cabot Street. This work was partially funded by a grant of $495,000 from the Massachusetts Department of Transportation (MassDOT). The grant was one of eight grant awards made in 2017 under MassDOT’s Industrial Rail Access Program. The re-opening of this bridge, which was last used in 2013, will allow the PVRR to interchange freight rail cars with the Pan Am Southern (PAS) railroad which provides freight rail service on the north-south rail line through Holyoke. The diagram below, from the rail industry journal Atlantic Northeast Rail & Ports (ANR&P), provides a nice overview of the area area in and around the bridge. 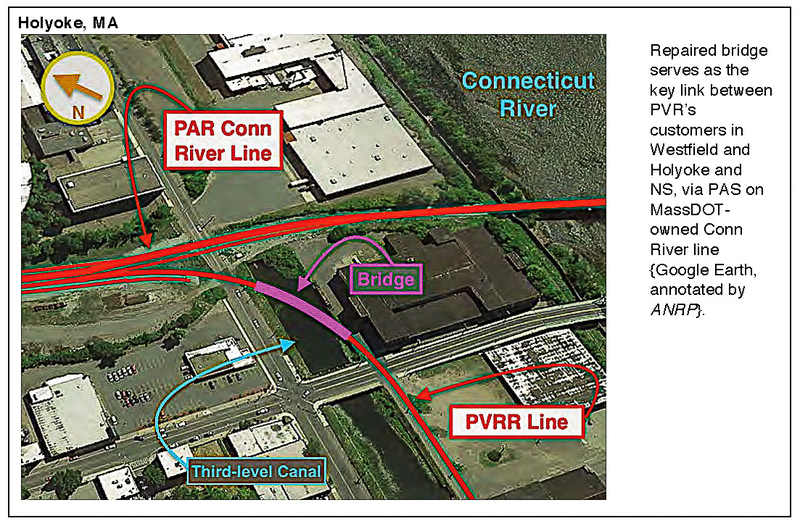 ANR&P’s December 8, 2018 edition reported that the PVRR/PAS Holyoke interchange is expected to reopen in early 2019 with the first traffic destined to the James Hardie Building Products, a major new customer for the PVRR. The James Hardie 237,000 sq-ft facility is located on the site of the former National Envelope Co. property at 70 Turnpike Industrial Road, Westfield — a site which was leased because of its proximity to the PVRR and the planned re-opening of the Holyoke interchange between the PVRR and PAS railroad lines. 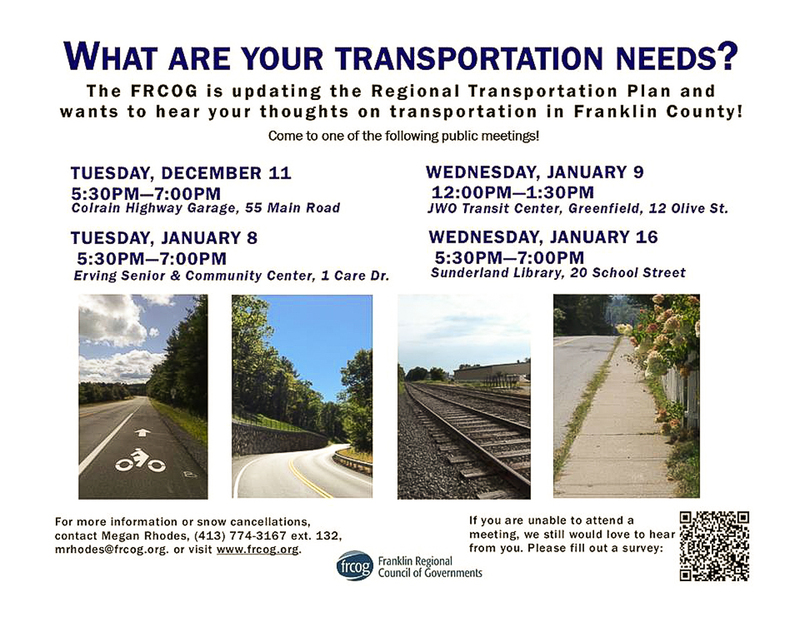 The Franklin Regional Council of Governments (FRCOG) is currently updating the Regional Transportation Plan for Franklin County. This plan is updated every 4 years and examines the current state of the transportation system in the region, including all modes of transportation – such as driving, walking, biking, and riding the bus or a train. The plan will identify the long-term transportation needs of the region and prioritizes key projects and activities. As part of the planning process, the FRCOG is seeking input from Franklin County residents and employees. There are 3 upcoming public meetings to listen to feedback and comments on transportation needs and priorities. We would also encourage people submitted using one of the addresses listed below. The Pioneer Valley Planning Commission is in the process of updating the Region Transportation Plan for the Hampden and Hampshire County regions. The Pioneer Valley Regional Transportation Plan outlines the direction of transportation planning and improvements for the Pioneer Valley through the year 2040. Progress related to the 2020 Pioneer Valley Transportation Plan update can be viewed on the project site linked below. Comments/question/input to the plan my be submitted using one of the addresses listed below. In this report, Julie Campoli of Sustainable Transportation Vermont, looks at efforts underway to bring additional passenger rail service to the Green Mountain State. The plan being put forward by David Blittersdorf of AllEarth Rail relies on the use of refurbished rail diesel cars that his company recently acquired from the transit agency known as Dallas Area Rapid Transit. Until not so long ago these cars were in service on Trinity Railway Express line between Dallas and Fort Worth. How this plays out is anyone’s guess at the moment, but its interesting to watch the many efforts in New England to re-establish or expand passenger rail service.